With pregnancy comes many new challenges and being able to sleep comfortably is one of them. Ironically, your body needs extra sleep when pregnant, yet the pregnancy itself causes the insomnia. It’s common for pregnant women to suffer from insomnia for no particular reason, or from a sore, growing body, heartburn, or having to get up frequently to use the bathroom. But just because it’s hard to sleep while pregnant, doesn’t mean it’s not important to get rest—both mom and baby need extra sleep to be as healthy as possible. 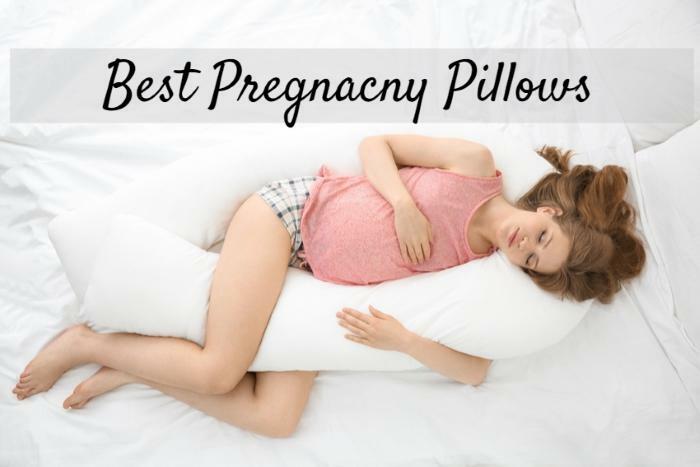 Fortunately, there are a variety of pregnancy pillows available that can help combat that insomnia by providing comfort and support everywhere you need it, no matter what stage of pregnancy you are in. Sleep Position: When you’re carrying around a much bigger belly than you’re used to, laying down can be uncomfortable, and the sleep positions you typically enjoy may not be an option anymore. 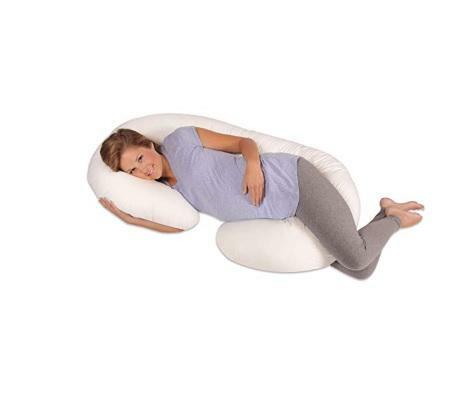 It can seem like no comfortable position even exists, but with the right pregnancy pillow, finding a comfortable position is possible for back, side, and even stomach sleepers. Your favorite sleep position is possible when pregnant, but there is a proper way to accomplish each one. For instance, if you like sleeping on your back, it is best to do so with your upper body propped up so that the extra weight of the belly isn’t placing too much strain on your body, plus the incline can help alleviate heartburn. If you like sleeping on your side, it is recommended that you sleep on your left side to keep blood and nutrients flowing easily to the placenta. If you are a stomach sleeper, you will need a larger pillow that you lay completely on top of (like an air mattress), and it will have a bowl-shaped section to accommodate your belly. The ultimate goal is to find a sleep position that is comfortable to you, and there will be a pillow that can address any of the issues that arise from it. For some, one large pillow will alleviate any and all stresses on your body, but others may find that they need multiple pillows, including between the knees or under the neck or lower back, to feel comfortable. Types of Pregnancy Pillows: Although there are hundreds of pregnancy pillows on the market, there are about 5 designs that are most common: wedge, c-shaped, u-shaped, s-shaped, and the standard, rectangular body pillow. Wedge pillows are usually made from a firm foam, don’t take up much space, and they are most effective in supporting your belly or back. 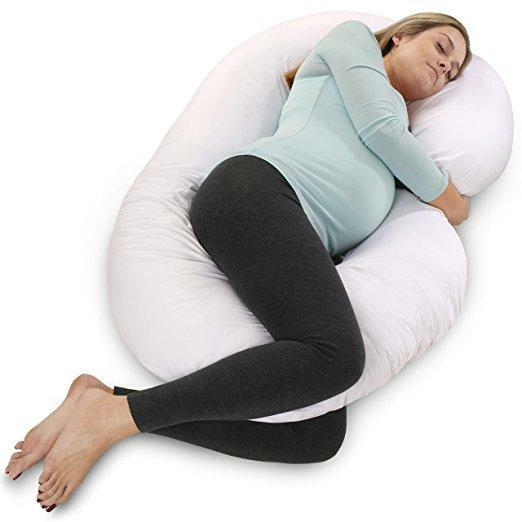 The other pregnancy pillow designs are large and bulky, usually running almost the full length of your body. Depending on how you use them, the c-shaped and u-shaped pillows can be wrapped around both sides of your body, and can support your head, neck, back, belly, hips, and knees all at the same time. The s-shaped pillows and rectangular body pillows are similar, but they don’t wrap around both sides of your body. Some women find that they are most comfortable with one design for their whole pregnancy, while other women change the pillow based on which stage of pregnancy they are in and their level of comfort. Since there is no real medical reason to use a pregnancy pillow, you can base your decisions about which pillows to use and when solely on what feels good to you. For example, you may find that a large body pillow, as well as another regular pillow, is a good combination for you, or one u-shaped pillow could be all you need for nine straight months. Materials: Like regular pillows, most pregnancy pillows have polyester fill, but sometimes you will find pregnancy pillows filled with air, memory foam, or microbeads. In some cases, the type of pillow determines the type of fill it has because some materials are more adaptable to certain sleep positions. Either way, it’s best to find the fill material that is most comfortable to you. The most common material used for pillow covers is cotton, but in general, you should look for a cover that has a low thread count for breathability. Pregnant women are naturally warmer, so any material that can accommodate that is a smart choice. Additionally, a machine-washable cover with a long zipper will make your life a lot easier and will help your pillow stay fresh for a longer period of time. What Are the Top Seven Pregnancy Pillows? Here is a summary of the top seven pregnancy pillows, each offering a unique combination of desirable features. All of these products are highly rated, and sleep tested. The Queen Rose Pregnancy Body Pillow is a u-shaped, full body pillow with bionic polyethylene filling. This unique filling material will not lose shape, and it is ideal for side sleeping or lounging and relaxing. It provides adequate support in several areas of the body to prevent any pain and soreness. This pillow also features a cotton, machine-washable, durable, zippered cover that adds to the comfort. The Queen Rose Pregnancy Body Pillow measures 55’x31’x7.8’ and weighs 5.5 pounds. Queen Rose offers a 90-day, money-back guarantee with the purchase of this pillow. The Leachco Snoogle Original Total Body Pillow has a c-shaped design that was created by a Registered Nurse and mom. This pillow hugs the body and provides comfort and support while staying cool all night. It supports your head, back, and belly, plus it takes the place of a separate pillow for between your knees. The cover is sham-style, and easily removable for washing. The pillow measures 60’x25’x7.2’, weighs 3 pounds, and is free from any harmful toxins or chemicals. Lastly, the Leachco Snoogle Original Total Body Pillow is available in 6 colors. The PharMeDoc Full Body Pregnancy Pillow has a c-shaped design that wraps around the body on both sides. It supports the head, neck, back, belly, hips, and knees. This pillow has premium polyfill and a jersey-knit cotton cover that is zippered and machine washable, plus it is hypoallergenic and free from any harmful chemicals or toxins. It can be molded to fit any position while sleeping or lounging. The pillow measures 57’x30’x7’ and weighs 7 pounds, and all seams are double stitched for durability. 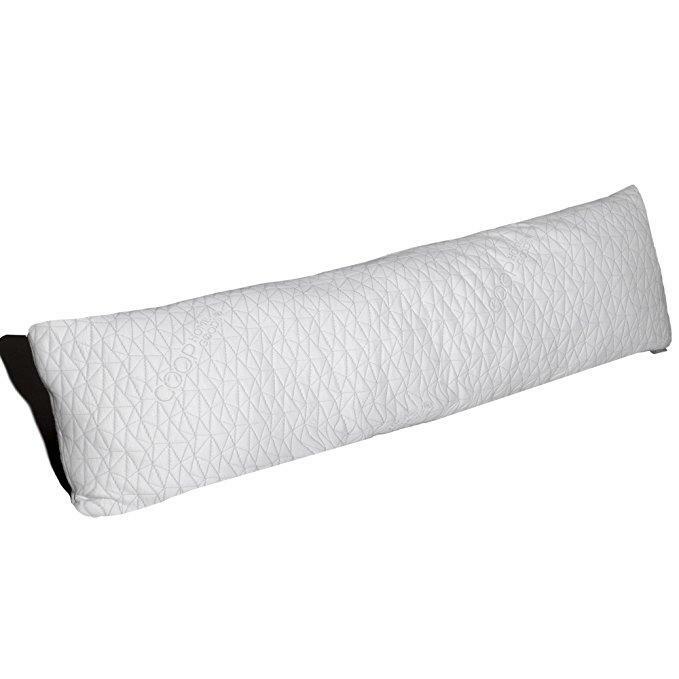 PharMeDoc offers a 30-day, 100% satisfaction guarantee with the purchase of this pillow. 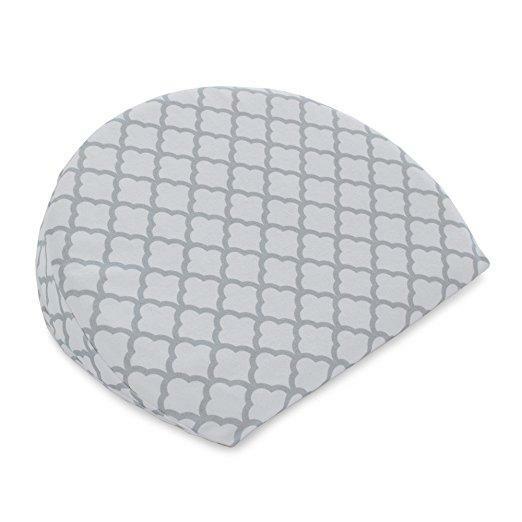 The hiccapop Pregnancy Pillow Wedge has a low-profile wedge design that provides ideal support for your back, belly, or knees. This pillow allows you to choose your firmness based on your needs—one side has deluxe, soft memory foam, and the other side has firm support foam. It has a soft, washable velboa cover, and the filling foam is CertiPUR certified, meaning it is free from harmful toxins and chemicals. Plus, the perforated foam is breathable and stays cool. Lastly, this wedge pillow is compact, measuring 13’x15’x4.5’, and lightweight at 12.2 ounces, making it perfect for travel. The Leachco Back ‘N Belly Chic Pillow has a u-shaped design that supports all sides of the body equally, so it won’t need to be moved or repositioned throughout the night. The support allows you to sleep comfortably without aches and pains in the back, neck, hips, or knees. It has a sham-style, removable cover for washing, and it has polyester fill. This pillow is moldable to whichever position is comfortable for you, whether sleeping, lounging, or nursing. It measures 51’x33.5’x8.8’ and weighs just over 7 pounds, plus it is free from harmful chemicals and toxins. 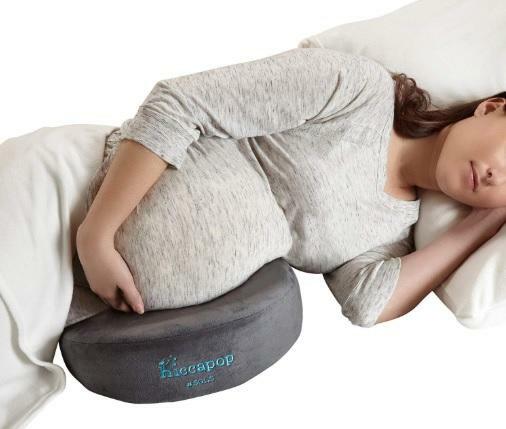 The boppy Pregnancy Wedge provide compact and portable support for the back, belly, and knees. It is lightweight, making it easy to move and reposition at night or while relaxing. This pillow features a soft, jersey cotton cover that is removable and machine washable, and it is filled with polyurethane foam. It measures 14’x4’x12’, weighs just 9.6 ounces, and is available in 2 colors. The boppy Pregnancy Wedge offers firm support where you need it, at home or on the go. The Coop Home Goods Total Body Pillow resembles a standard, rectangular pillow that is extra-long. It is filled with shredded, gel-infused memory foam and microfiber that can be molded and contoured to your position and body, and it features a combination viscose rayon and polyester fabric cover. All of the materials are hypoallergenic, dust mite resistant, and CertiPUR certified (free from harmful chemicals and toxins). It measures 20’x54’, weighs 6.65 pounds, and the entire pillow is machine washable. Additionally, Coop Home Goods offers a 100-night, no hassle trial as well as a 5-year warranty with the purchase of this pillow. What Else Should You Consider When Using and Purchasing Pregnancy Pillows? There are a few other points to take into consideration when deciding on a pregnancy pillow, including your comfort, the seasons you will be pregnant in, and the stages of pregnancy. Since choosing a pregnancy pillow depends on your perception of comfort, the best one is the one that relieves your aches and pains and lets you achieve restful sleep. But, what you think is comfortable may change throughout the duration of your pregnancy. For example, the late stages of pregnancy may require a more supportive pillow than you the one that made you comfortable in the early stages. It’s also important to consider the seasons of your pregnancy—pregnant women usually run hot and a bulky pillow could make that worse, especially during the summer months. For this reason, a pillow that will stay cool all night is desirable. Similarly, you will want to find a pregnancy pillow that is hypoallergenic because it is common for women to become irritated by materials that didn’t bother them before. So, it’s best to choose the healthiest option for mom and baby. Pregnancy is full of stress, aches and pains, and emotional ups and downs, and getting adequate sleep can help ease these for you and your spouse. A pregnancy pillow is the tool you need in order to rest effectively, and it provides support that a regular pillow, or multiple regular pillows, can’t. So, it’s easy to see that the benefits of a pregnancy pillow outweigh the price of buying one that is quality. 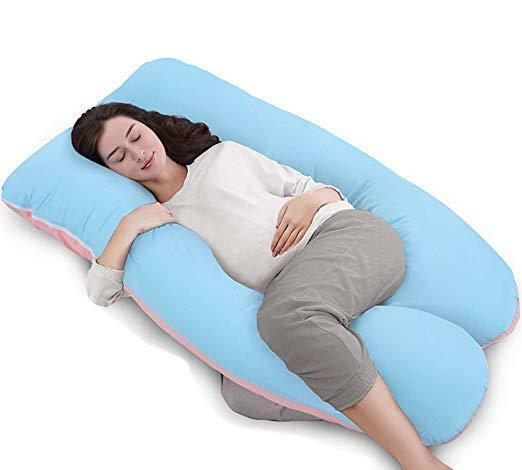 Hopefully, you now have a good idea of what to look for in a pregnancy pillow and you find one that is so comfortable that you will want to use it even when you’re not pregnant. Most women would agree that the best bra is no bra, but some people believe that wearing a bra while sleeping can prevent your breasts from sagging as you age. Although there is no real science to prove this, there may be times when you need to wear a bra for bed, or you just prefer to. Of course, the best bra for sleeping would be as comfortable as possible— no wires, no padding, no clasps, and loose fitting, while also providing shape and coverage. Because of this, most sleep bras are similar to maternity/nursing bras or sports bras without all of the compression. Why Wear One: There’s good reason for why women prefer to sleep braless: that’s what’s most comfortable. So why wear one? There are a few different reasons: you simply prefer to, you are trying to prevent breast sagging, you have recently had surgery, or you are in a situation where there will be other people around when you’re sleeping. Some women, especially those with larger busts, find that sleeping without a bra is uncomfortable because their breasts can get in the way of certain sleeping positions, which could even be painful, so they prefer to wear a bra to bed. Other women believe that wearing a bra at all times can combat the natural aging, and subsequent sagging, of their breasts (more on that later). There is another group of women that need to wear a bra to sleep because it aids in their recovery from surgery, whether it was a breast reduction surgery, a breast enlargement surgery, a single or double mastectomy, or a reconstruction surgery. The last group of women who seek sleep bras are those that need to be somewhat modest while lounging or sleeping. There are several situations where this could be the case. For instance, you may have overnight guests that you don’t want to expose yourself to, or maybe you are taking a trip where you will be sharing a hotel room with other people. Chest Size: Chest size is usually the first factor that comes to mind when looking to purchase a bra. Women know that certain bras just don’t work with certain chest sizes; for example, big-chested ladies cannot wear bras with straps that are unable hold the weight of their breasts because they will have back pain, and small-chested ladies could have trouble finding a bra that has small cups and a strap that isn’t too tight around their ribs. But since sleep bras are intended to be less supportive and less about looks than everyday bras, they can be adapted to any body. Sleep bras typically have a simple, modest design, which allows them to keep any size breasts in their rightful place. Even though sleep bras all seem to be very similar to each other, there are variations that address the differences in bust size. Usually sleep bras for large chests have strong, wide bands, lots of stretch in the cups and bottom band, and possibly some clasps that can make it easy to get on and off. Sleep bras for smaller chests don’t need much support, and probably don’t have clasps, but they should still be very stretchy to maintain comfort. Keep in mind that many sleep bras are labeled as sports bras, and they tend to run small because the compression gives more support during periods of activity. But if you are using the bra for lounging or sleeping, it is best to size up to ensure that the bra is not too tight when you are trying to relax. Similarly, sleep bras, whether they are labeled as sports bras or nursing bras, are prone to shrinking. This provides another reason for why you may want to size up when you are purchasing a bra you will use for sleep. Comfort: Just because you can wear regular bras to sleep and lounge, doesn’t mean they will be comfortable, and if you’re looking for a sleep bra, comfort is the number one priority. There are several features of a bra that can determine how comfortable it is, including fabric type, clasps, how it goes on and comes off, underwires, and bands/straps. Although sleep bras don’t vary as much as regular bras, there are differences between them that could be more or less comfortable to you. First, many sleep bras are made from cotton, spandex, nylon, or polyester, and could have satin-like trim. Some of these fabrics may be more comfortable to sleep in than others, especially cotton, which is usually the softest. Next is the bra’s closure. A large amount of the sleep bras available have no clasps because clasps are known to dig into the body, no matter where they are located, which obviously goes against the comfort of the bra. However, there are some clasps that are placed in just the right spot or are padded well enough that they do not cause discomfort, which is why they are included in some sleep bras. In addition, clasps are directly related to how the bra goes on and comes off. Usually, clasps make it much easier to put the bra on and take it off, whereas putting on a pull-over bra can turn into a wrestling match. Instead, some women step into a bra without clasps and pull it up to their chest. Similarly, almost no sleep bras have underwires. Although underwires are common in regular bras, they are very uncomfortable for sleeping and lounging for the same reasons clasps are. Underwires are known to poke you in the sides or the center of your chest, and can even come through the fabric, which could be dangerous. All of this proves that their place is not in sleep bras. 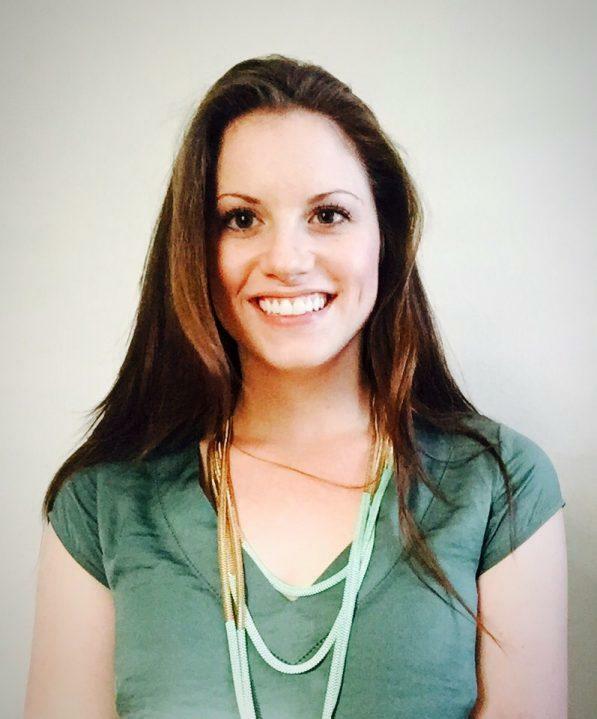 Lastly, the bottom band and shoulder straps of the sleep bra can make a big impact on comfortability. The goal is to find a bottom band that fits the circumference of your upper abdomen in a way that’s not too tight that you can’t breathe but not too loose that you lose some of the support and shape of the bra either. In the same way, the shoulder straps should be able to support the weight of your breasts without digging in to your shoulders and causing pain and discomfort. What Are the Top Seven Sleep Bras? Here is a summary of the top seven sleep bras, each offering a unique combination of desirable features. All of these products are highly rated, and sleep tested. The Hanes Women’s Cozy Seamless Wire-Free Bra resembles a sports bra and is constructed with 4-way stretch fabric for ultimate comfort. This pullover bra has no wires and no clasps but provides some shape with full-coverage cups. The wide bottom band and straps add more comfort and with just enough support. This sleep bra is made from nylon and spandex, and it comes in 29 colors and sizes from small to 3X. The Fruit of the Loom Cotton Pullover Sport Bra has a simple design that mirrors the top half of a spaghetti strap tank top. It is made with cotton lycra and spandex, and has no clasps, wires, or tags. This bra comes in packs of three with a wide variety of color combinations and in sizes 32 through 44. Plus, each pack comes with one set of optional pads. The Carole Martin Full-Freedom bra is constructed with a stretchy nylon and spandex blend with no wires. This bra has a front hook-and-eye closure for easy entry and exit without adding discomfort. It also has extra wide straps that won’t dig into your shoulders. The Full-Freedom Comfort Bra is available in 5 colors and sizes 34 through 48. The Hanes Women’s Comfort Evolution Bra is a wire-free bra with a sweetheart neckline. This bra has a sleek, seamless design with satin trim. It has a hook-and-eye back closure with fuller cups for appropriate coverage. The Comfort Evolution Bra is constructed with 4-way stretch fabric made from polyester and spandex. Finally, it is available in 16 colors and sizes from small to 3X, plus there is the option of purchasing a two pack. 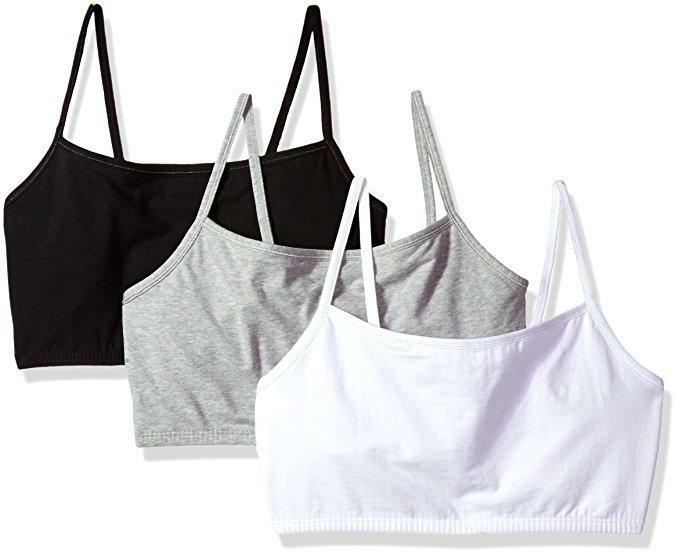 The Fruit of the Loom Built-Up Sports Bra is made from two-ply cotton lycra spandex and provides more support than the rest of the bras on this list. There are no clasps and no wires, and it has a smooth, seamless appearance. This bra comes in packs of three with your choice of 17 different color combinations and sizes 34 through 50. The Kindred Bravely French Terry Racerback Nursing Sleep Bra is the recipient of a Mom’s Choice Award, and it is built with soft French Terry, rayon of bamboo, and spandex. There are no wires and no clasps, and since it is normally meant for breastfeeding, the cups adapt to changing breast sizes. The design of this bra includes a supportive bottom band and pull-aside front flaps. Even though this bra is meant for nursing, the design and features make for a comfortable sleep bra. It is available in 11 colors and sizes extra small through 2X. 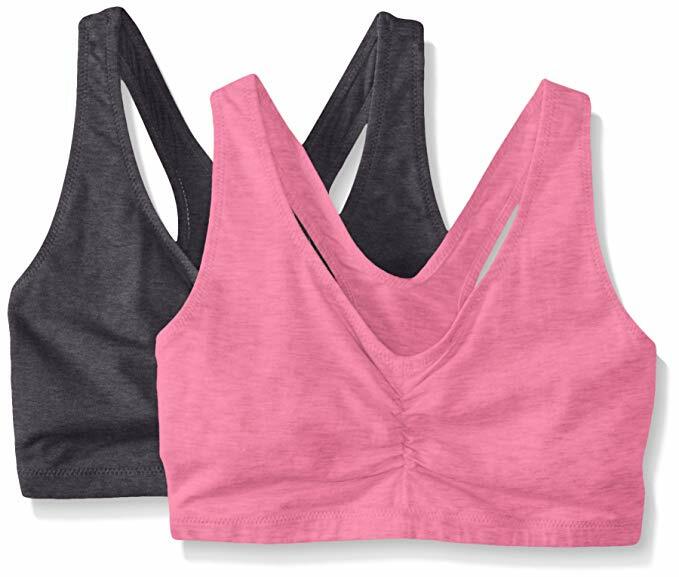 The Hanes Comfort-Blend Flex Fit Pullover Bra resembles the design of a racerback sports bra with no wires and no clasps. It is made with 4-way stretch fabric, which includes cotton, polyester, and spandex. 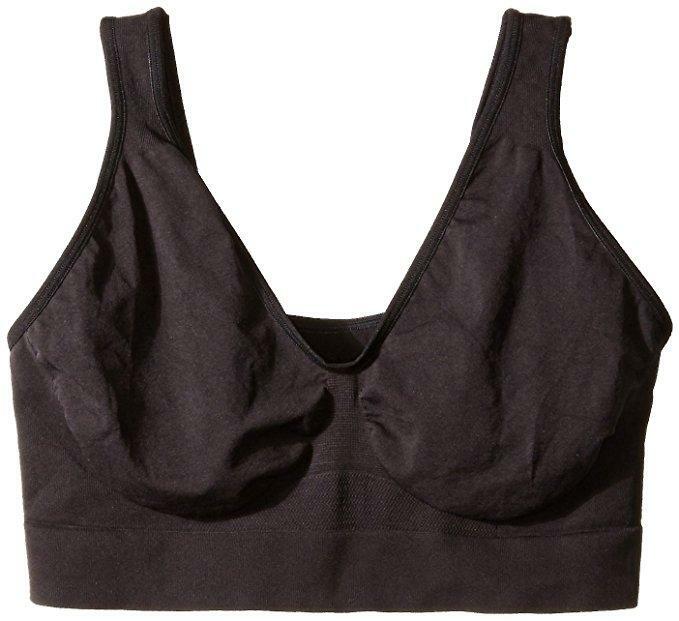 This two-ply bra provides minimal support due to the cinched front design. Lastly, it is available in packs of 2 with 22 different color combination options and sizes small through 3X. As mentioned earlier, some women believe that wearing a bra while sleeping can maintain the youthful look of your breasts and prevent the natural sagging that comes with aging. This idea has been popularized by our society, but in the distant past, women believed the opposite: sleeping with a bra would make the sagging worse as you age. So, it begs the question, which of these theories is true, if any of them? The answer to that question isn’t so simple. All breasts will sag as aging occurs; it’s inevitable because the tissue that holds breasts in place gradually loses its strength and elasticity over the course of a woman’s life. Plus, there are many factors that contribute to breast sagging, including pregnancy and nursing, family history, smoking, weight loss/gain, and activity level, all of which can add up to more sagging than a bra can prevent. In addition, sagging only occurs as a result of gravity pulling breasts downward, so when you are lying down asleep, no gravity is pulling on your breasts, so a bra is almost redundant. One last point is that a bra that is too tight can be harmful. Because the chest area contains important pieces of our anatomy, a bra that is too tight could restrict blood supply and even hinder the function of the lymphatic system, which could become less effective in clearing toxins from the body. All of this proves that bras, specifically when worn while sleeping, do not prevent sagging and have no real medical benefit. But, sleep bras are still useful for the other reasons listed above, and when they fit correctly. When you are searching for a sleep bra, comfort is key, and part of comfort is finding a bra that has the right fit, support, and coverage. Although many sleep bras are categorized as sports bras or nursing bras, any bra that provides the comfort and function you are looking for is the perfect sleep bra for you.